Distribution of major Buddhist traditions, East Asian Mahayana in yellow. 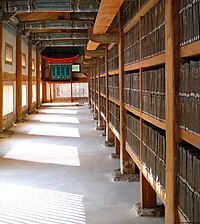 Tablets of the Tripiṭaka Koreana, an early edition of the Chinese Buddhist canon, in Haeinsa Temple, South Korea. East Asian Buddhism or East Asian Mahayana is a collective term for the schools of Mahāyāna Buddhism that developed in the East Asia, and follow the Chinese Buddhist canon. These include the various forms of Chinese Buddhism, Japanese Buddhism, Vietnamese Buddhism and Korean Buddhism. Besides being a major religion in these four cultural regions, it is also a significant religion in Singapore and Malaysia. East Asian Buddhists constitute the numerically largest body of Buddhist traditions in the world, numbering over half of the world's Buddhists. East Asian forms of Buddhism all derive from sinicized Buddhist schools that developed between the Han dynasty (when Buddhism was first introduced from Central Asia) and the Song dynasty, and therefore they are influenced by Chinese culture and philosophy. Some of the most influential traditions include Chan or Zen Buddhism, Pure Land Buddhism, Huayan, Tiantai and Chinese Esoteric Buddhism. These schools developed new, uniquely Asian interpretations of Buddhist texts and focused on the study of Mahayana sutras. According to Paul Williams, this emphasis on the study of the sutras contrasts with the Tibetan Buddhist attitude which sees the sutras as too difficult unless approached through the study of philosophical treatises (shastras). The texts of the Chinese Canon began to be translated in the second century and the collection continued to evolve over a period of a thousand years, the first woodblock printed edition being published in 983. The modern standard edition is the Taishō Tripiṭaka, produced in Japan between 1924 and 1932. Besides sharing a canon of scripture, the various forms of East Asian Buddhism have also adapted East Asian values and practices which were not prominent in Indian Buddhism, such as Chinese ancestor veneration and the Confucian view of filial piety. East Asian Buddhist monastics generally follow the monastic rule known as the Dharmaguptaka Vinaya. One major exception is some schools of Japanese Buddhism where Buddhist clergy sometimes marry, without following the traditional monastic code or Vinaya. This developed during the Meiji Restoration, when a nationwide campaign against Buddhism forced certain Japanese Buddhist sects to change their practices. ^ The Buddhist World, The Buddhist World: Buddhism in East Asia - China, Japan, and Korea. ^ Charles Orzech (2004), Esoteric Buddhism and the Tantras in East Asia. Brill Academic Publishers, pp. 3-4. ^ Gethin, Rupert, The Foundations of Buddhism, OUP Oxford, 1998, p. 257. ^ Williams, pAUL, Mahayana Buddhism: The Doctrinal Foundations, Taylor & Francis, 2008, P. 129. ^ Gethin, Rupert, The Foundations of Buddhism, OUP Oxford, 1998, p. 258. ^ Harvey, Peter, An Introduction to Buddhism, Second Edition: Teachings, History and Practices (Introduction to Religion) 2nd Edition, p. 212.